a blog for writers by (you guessed it!) a writer! I’ve been all over the net lately sucking up valuable information and insight from other authors and bloggers, so today I thought I’d share some of my favorites. I’m taking a page from Jenny Hansen (Jenny calls this “pimping”) and asking you to share your own favorite links, either a post you love of your own crafting, or someone else’s that you love. 1. For a good kick in the keister check out Writer’s in the Storm guest author Jane Porter’s Ten Keys to Success and Survival in the Romance Industry. Jane’s been an author for a long time and she’s seen many of the changes that have rocked out publishing world. 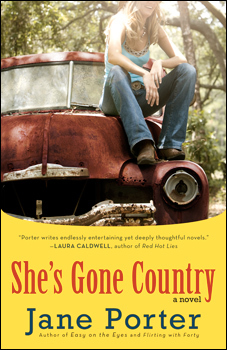 I first was introduced to her with her single title She’s Gone Country, the story of a divorced mom of two going back to her home on the range. Loved it! There are so many lines in her blog post that I wanted to quote here that I realized I ran the risk of copyright infringement! So here is just one, and you’ll have to visit Writer’s in the Storm for the rest. “I put Attitude near the top of the Survival list because attitude is everything. See! You want to read the rest of the article now, don’t you? 2. Another fascinating post is by one of my favorite bloggers, Dean Wesley Smith. Dean (Yes, I am assuming first name basis here. After all I visit his blog all the time.) If you want to know what is really going on with our crazy industry, you need to be reading his blog, and his wife, Kathryn Rusch’s blogs as well. They’ve done it all from script writing, to working with the Big Six, to owning their own publishing company and they spend a lot of time thinking and reading and writing about publishing. This blog is about how Indie Authors can sell in book stores and why it’s not just feasible to try, but it’s happening now. To them. This will change how print books sell. Actually, it already is. 3. Her Story Calls is a fun writer run blog where some of my pals write about all sorts of topics from their day to day lives to OMG writing! But starting May 25th they are dedicating their blog to fighting cancer. If you are an author with a cancer story: survival, friends, family, whatever has affected you and yours, they want you as a guest blogger. Check out their site for this amazing opportunity to share your story and to raise money for The American Cancer Society. And if you are lucky enough to be someone who hasn’t been affected, hop on by May 25th-June 25th to support those who have. That’s all folks! So, what links do you love this week? You can pimp your own or someone else’s, or both! Oh, so you’re turning the tables and giving me teaser blogs to try to find time to read. Way to go. These sound great and I’ll have to check them out but right now I have over 80 emails in my inbox because I got a little crazy signing up for other excellent, well touted feeds. They were like Swiss chocolate to this hungry-for-writing info blogger/author and I could have resisted but I didn’t. Now I have to find more hours in the day. So. these look intriguing, especially the one about self-published books in book stores. Oh, how the world is changing. Feedly? What and where is that? Oh I could use that! I love Scrivener, but I’m sure I’m not utilizing even half of what it does. I did buy Gwen’s book and it’s been very useful, but I’m sure if I took a class that I would have gotten further than halfway. Two classes at the same time is a lot. I’m not sure I could do two, something would have to give. I’m taking an RWAU class on writing a business plan and I’m about to give up on reading all the comments!